Several weeks ago I cracked a tooth, which had to be capped with a crown. Years ago this would have required the dentist to cut away the broken sections of tooth, and then a mold would be sent off to a manufacturer. The crown would come back several weeks later, while in the meantime I'd have to be very careful of the broken tooth. That was then, this is now. 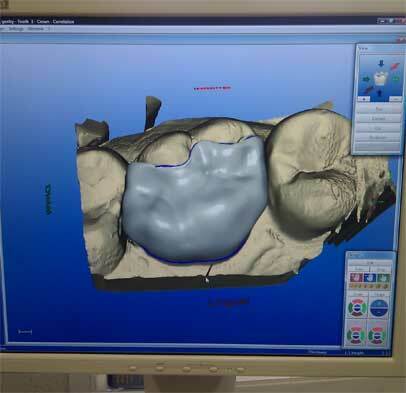 Now the dentist uses a laser scanner to make a 3D model of the shape of the tooth before and after trimming out the broken section. The difference between the two gives the rough shape of the crown to be made, which the dentist can adjust with CAD software. He described the adjustments as "the tooth the way it was twenty years ago, not the way it is now." Now we don't send this CAD model off to be manufactured. The dentist has a CNC milling machine in the office. It starts from a ceramic ingot and cuts away anything which isn't shaped like the desired crown. We're living in the future, where replacement body parts are sculpted on demand. It makes me feel old that I can remember it wasn't always this way.